From January 30 to February 5, Okinawa Governor Takeshi Onaga, accompanied by a delegation of “All-Okinawa Kaigi (conference),” visited Washington D.C. It was his third visit to the center of U.S. power since he took over the office of Governor in November 2014. Just like in his previous visits, the purpose of his visit this time was to ask those on Capitol Hill to cancel the plan to relocate the U.S. Futenma Air Station in Ginowan City to Henoko and Oura Bay in Nago City. Throughout his visit, he emphasized that the people of Okinawa continue to oppose the construction a new base there (the Henoko plan) and that he would use all his administrative power and means to stop the construction. How did Governor Onaga’s visit go? What would Governor Onaga and the people of Okinawa do next? Here are our reviews and analysis. Court Decision in Japan and Trump Chaos in the U.S. Unfortunately for Governor Onaga and Okinawa, his trip took place against the backdrop of two unfavorable circumstances. First of all, on December 20, 2016, the Japanese supreme court ruled against Governor Onaga, deciding that Onaga’s revocation of the land reclamation permit granted by former Okinawa governor Hirokazu Nakaima was illegal (see The Japan Times). Four days later on December 26, Governor Onaga withdrew his revocation, claiming that he had to follow the rule of law and insisting that he has other "administrative means" to continue his fight. His withdrawal cleared up the legal hurdle for the Japanese government, enabling the Okinawa Defense Bureau to resume its drilling surveys and construction activities, which had been halted since March 2016. Secondly, as the world has already known by then, with Mr. Trump in the White House, chaos was the name of the game in Washington D.C. Congress men and women as well as federal agencies were very much occupied with their own issues, and apparently they did not have time for Onaga and Okinawa. Despite Governor Onaga’s gleam of hope that the un-orthodox President Trump and his administration still in process of being formed could provide political space for change on the Henoko plan in U.S. policy (see The Mainichi Shimbun), his team faced difficulty even scheduling meetings with Congress members and federal officials. In short, Governor Onaga arrived in a chaotic D.C. without much to show to back up his claims. Governor Onaga was able to meet twelve House representatives but no senators. He also met with Joe Young, Director for Japanese affairs at the State Department and Paul Vosti, the acting director for Japan in the Pentagon. 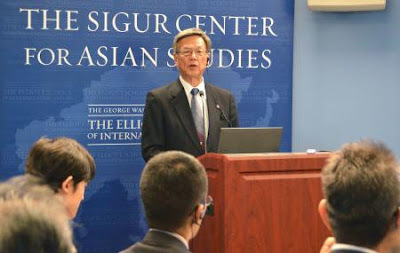 He also participated in a symposium at George Washington University (see The Asahi Shimbun). At a press conference at the National Press Club in D.C., Governor Onaga summarized his visit as a success and better than the previous visits. He emphasized that “We were able to gain understanding on the Okinawa base issues, including the construction of the new base, from members of the Senate and House” (The Ryukyu Shimpo). However, the media covered and evaluated his trip differently. The Okinawan media, which reported Governor Onaga’s previous trips to D.C. in very favorable terms for him, was very critical this time. While regarding the Henoko plan as undemocratic and unjust, they casted doubt on the timing of his visit as well as what his visit had actually accomplished (see for example The Okinawa Times (in Japanese only)). 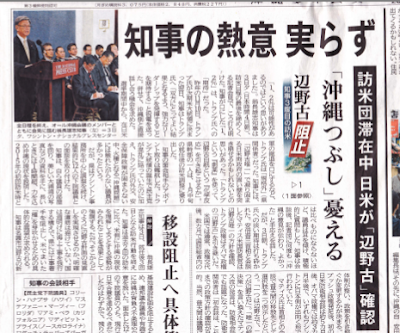 Headlines read "Governor's enthusiasm fails to bring results" "U.S.-Japan reaffirm Henoko plan as Okinawa delegation visits U.S." "Concerns raised over "Crushing Okinawa""
Meanwhile, the Japanese mainland media paid little attention to Governor Onaga’s visit. Instead, they focused on the larger political shows in Tokyo of newly appointed Defense Secretary James Mattis’ meetings with Prime Minister Shinzo Abe and Defense Minister Tomomi Inada (see their joint briefing), which were taking place as Onaga was finishing up his trip. In fact, in most of the Japanese media coverage, Onaga’s visit and his determination to fight the Henoko plan was pitted against and was undermined by the governments’ affirmation that the Henoko plan is “the only resolution” (see The Asahi Shimbun). The U.S. media’ coverage was minimal, to say the least. As Tim Shorrcok tweeted, he was the only U.S. reporter at Governor Onaga's press conference at the National Press Club in D.C. So far, we at OEJP have found only two articles on Governor's visit by non-Japanese media on the internet. One is by Tim Shorrock on the LobeLog Foreign Policy (read the article) and the other is by the Russia Today (read the article). It is probably too early to tell what Governor Onaga’s third visit to Washington D.C. has accomplished and what effects it will have in the future. However, reviewing our discussion with prefectural government officials and others as well as documents and media reports, we can argue that there was lack of strategic preparation and engagement on the part of Governor Onaga and the prefectural government. As Governor Onaga was preparing for his trip, the Okinawa prefectural government’s inquiries with the Okinawa Defense Bureau on the details of drilling surveys and land reclamation plans were still in process. Without sufficient information, it appears, Governor Onaga could not move on to use his next “administrative means” to stop the construction before his departure for Washington D.C. Meanwhile, as evident by the fact that there was only one U.S. reporter present at his press conference in D.C., the prefectural government failed big in terms of public relations. Dishearteningly and disturbingly, there were no releasing of statements or documents explaining Governor Onaga’s position and Okinawa’s situation from the Okinawa prefectural government before, during and after his visit. Moreover, the home page of the Washington D.C. Office of the Okinawa Prefectural Government, which was set up to “play a key role in the Governor’s visits to the U.S. and disseminating information on Okinawa’s situations and other matters” (see the site), DID NOT cover its Governor's visit to D.C. (We do not know why but let you know when we find out why). It is no doubt that Governor Onaga and the Okinawa prefectural government have been overwhelmed by the Henoko issue (and other U.S. military related issues). It is also apparent that Governor Onaga and his prefectural government's capacity to challenge the Henoko plan has been undermined by both external and internal factors. However, Okinawa's fight against the Henoko plan continues. As soon as the Okinawa Defense Bureau resumed drilling surveys, protesters were out in kayaks and boats in Oura Bay as well as were at the front gate of Camp Schwab in Henoko (The Asahi Shimbun). Back in his office in Okinawa, Governor Onaga and his team are now examining his "administrative means" and assessing when to take the next step to halt the construction. In our view, there are two important elements that have kept and will keep Okinawa’s fight going. One is the determination of the people of Okinawa and their supporters to fight. Their determination comes from their experience of suffering from living with so man military bases on their small islands for 70 years (see for example The Mainichi Shimbun and The Japan Times). Enough is enough. The other element is the invaluable natural environment of Henoko and Oura Bay. 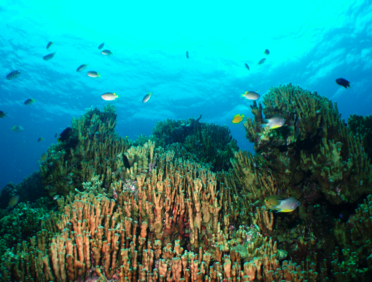 As an integral part of northern Okinawa Island (a part of this area has been officially nominated for World Natural Heritage Status), the natural environment of Henoko and Oura Bay provides the people of Okinawa with both a reason and a tool to continue their fight (see IUCN Recommendation, the joint statement by 19 academic and scientific societies, and this joint statement by NGOs). 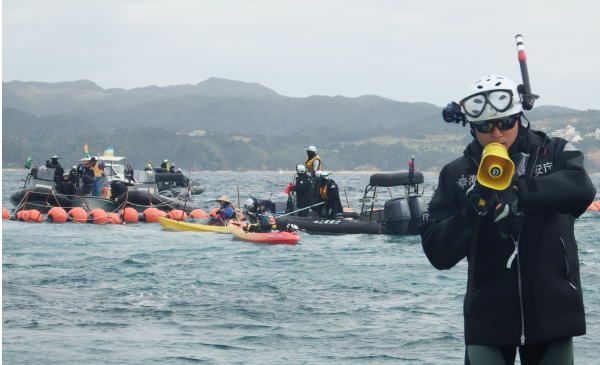 OEJP joins Okinawa's fight against the construction of a new U.S. military base in Henoko and Oura Bay on the environmental front.